Over the past four decades, there has been immense progress in every area of lignin science, ranging from the enzymology of lignin biodegradation, to the delignification of wood fiber during pulping and bleaching, to advances in spectroscopy. 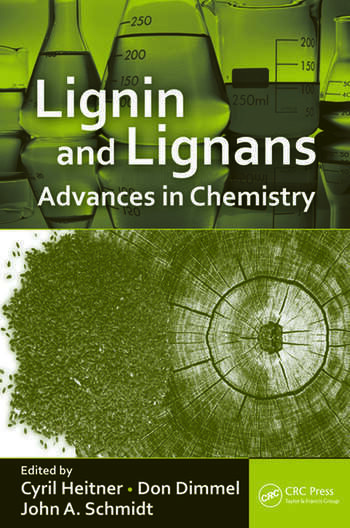 Lignin and Lignans: Advances in Chemistry captures the developments that have been achieved by world-class scientists in the most critical aspects of this burgeoning field. After an overview of the topic, the book discusses the significance and comparative performances of the most commonly used chemical degradation methods and presents lignin structural information based on the use of these methods. Next, the book explores spectroscopic methods, including UV-visible absorption, fluorescence, Raman, infra red (IR), near-infrared (NIR), nuclear magenetic resonance (NMR), and heteronuclear NMR spectroscopy. It then compares the results of studies of lignin in situ with studies of isolated lignins. The authors discuss polymer properties related to thermal stability and molecular motion of lignin in the solid state. They describe applications of electronic structure calculations to the chemistry of lignin, and they explore lignin reactions that occur during the chemical pulping of wood by soda, kraft, AQ, and polysulfide processes. The book describes chemical pulp bleaching, oxidative and reductive lignin-retaining bleaching, and lignin biodegradation. It also examines the application of microorganisms and the enzymes they produce in the manufacturing of chemical and mechanical pulp. The book closes with chapters on photodegradation and chromophore formation and the pharmacological properties of lignans. Highlighting significant developments on selected topics, this essential reference for those in industry and academia is designed to fuel further research and discovery in this specialized area, especially in the emerging field of biorefining. Reactivity of Lignin-Correlation with Molecular Orbital Calculations; T. Elder and R. C. Fort, Jr.
Cyril Heitner retired from Pulp and Paper Research Institute of Canada (now FPInnovations) after a 36-year career. He received his BSc in chemistry from Sir George Williams University in 1963, his MSc in physical organic chemistry from Dalhousie University in 1966, and his PhD in organic photochemistry from McGill University in 1971. Dr. Heitner has made significant scientific contributions in the area of chromophore chemistry of lignin-containing pulp and paper. This research has led to the development of a yellowing-inhibitor system that is close to commercial development. Donald Dimmel, formerly of the Institute of Paper Science and Technology in Atlanta, has been retired from professional life since 2002 and lives in Prescott, Arizona. He received a BS in chemistry from the University of Minnesota in 1962 and a PhD in organic chemistry from Purdue University in 1966. He has authored 100 refereed technical publications and patents. His research interests concerned reducing the energy and environmental impact associated with producing paper pulps from wood. Much of his research focused on developing a better understanding of the chemistry of lignin removal and carbohydrate degradation reactions that occur during pulping and bleaching. John A. Schmidt is a principal scientist at FPInnovations, Paprican Division, in Pointe-Claire, Quebec, Canada. Dr. Schmidt earned a BSc in chemistry from the University of Western Ontario in 1979 a PhD in 1986. He has published 38 articles in peer-reviewed journals, holds five patents, and is a recipient of TAPPI’s Best Research Paper Award. Dr. Schmidt’s research interests are the photochemistry of lignocellulosic materials, pulp bleaching, aging and stabilization of paper, and wood-derived bioproducts. "This book was accomplished with the contributions of renowned specialists in the field of lignin chemistry, and it is a very useful tool for many scientists, students and postgraduates aiming at opening a new era for this valuable compound accessible from renewable resources processed by biorefining. It may be helpful not only in research and development, but also in the line of teaching."